GM of the Amari Rincome Wim Fagel hosted a dinner in honour of South African Ambassador to Thailand Douglas Gibson during his visit to Chiang Mai last week. 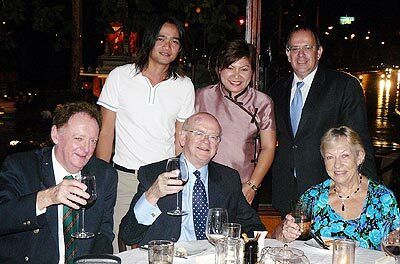 Pictured here: Chaianan Meechuay, Pinkaew and Wim Fagel, (back row), and Allan Riddell with the Ambassador and his wife Pamela (seated). 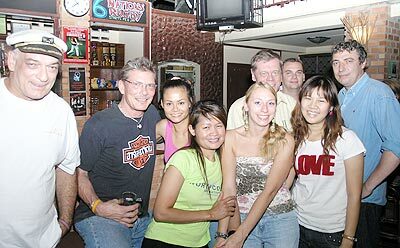 Chaz (right) celebrating his birthday recently with friends and customers at the Tuskers Bar and Grill. 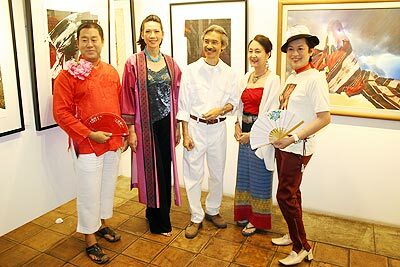 On April 5, the President of Skål, Anchalee Kalmapijit, was invited by Thitaya, the owner of the Tita Gallery, to open its latest exhibition, ‘Weaving Beauty’, a collection of paintings by Wattana Wattanapun. Pictured are Ongkarn, Anchalee, Ajarn Wattana, Ajarn Jeerajun and Varanont (l/r). The exhibition will be open to the public until the end of the month. 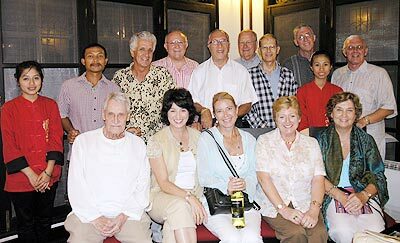 John Cooley (back row, fourth from the right) with friends, enjoying a dinner he had arranged at the Yangtze Jiang Hong Kong Chinese Restaurant.